BBC Music have announced that Harry Styles At The BBC - a world-exclusive hour-long entertainment show hosted by Radio 1 DJ Nick Grimshaw - to be broadcast on BBC One this autumn. Harry, who earlier this year began his career as a solo artist when he premiered his debut single Sign Of The Times on The Radio 1 Breakfast Show with Nick Grimshaw, will perform tracks from his self-titled number one debut album - as well as talking to friend Nick about his career and life to date, being a solo artist and the start of his acting career. 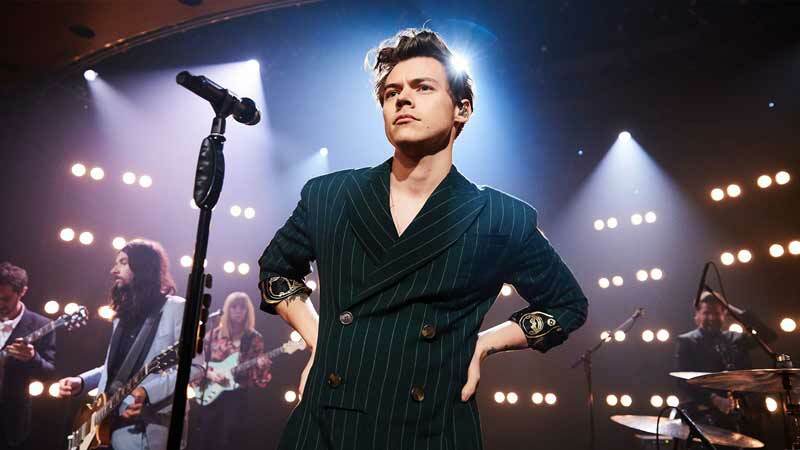 The one-off 60-minute special from BBC Studios, filmed in front of a live studio audience at dock10 in Manchester, will be broadcast on BBC One in November and will include songs Harry has never previously performed for a TV audience. The show follows in the footsteps of Adele At The BBC and Michael Bublé At The BBC, which were both BBC Studios productions. Broadcast in November 2015 on BBC One, Adele At The BBC, presented by Graham Norton, was nominated for Best Entertainment Programme at the Bafta Awards. A sketch within the programme, which saw Adele impersonate herself in-front of Adele impersonators, broke the BBC YouTube channel record by gaining over 60 million views. Nick Grimshaw says: "Harry is a great performer and full of so many wonderful stories about his extraordinary career, which he'll be sharing with us, I can't wait for this show!" Bob Shennan, Director of BBC Radio and Music says: "BBC Music is committed to supporting a range of new and established acts, and I'm very happy that we're able to bring Harry to BBC One this autumn for such a unique show." Guy Freeman, Editor, Special Events and Formats, BBC Studios says: "These shows are all about creating a world in which superstars like Harry feel incredibly comfortable and alongside their brilliant, live performances, can simply have fun and enjoy revealing more of themselves to viewers than is ever normally possible."